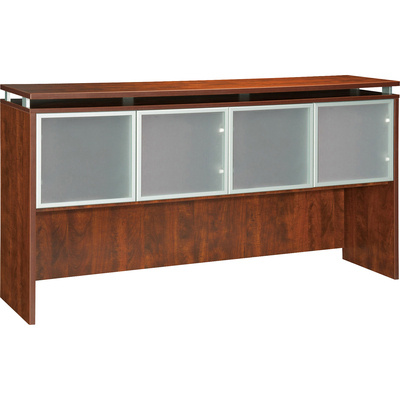 Hutch Attaches To 66-1/8" Wide Credenzas In The Lorell Ascent Series Laminate Furniture To Add Overhead Storage. The Ascent Series Offers Contemporary-Style Laminate And Raised, 1" Thick Floating Tops. Cherry Laminate Surface And Side Panels Are Built For Durability And Are Stain-Resistant And Scratch-Resistant. The Top Is Supported By Aluminum Brackets To Provide The Floating Appearance. Four Doors Feature A Gray Aluminum Frame And Frosted Gray Glass To Keep Contents Private But Identifiable In The Two Compartments. Shelf Holds Up To 44 Lb. (20 Kg.). Use The Grommet Hole For Easy Cord Routing. Design Also Includes 3mm Pvc Edges (Color-Matched)..
Hutch Attaches To 66-1/8" Wide Credenzas In The Lorell Ascent Series Laminate Furniture To Add Overhead Storage. The Ascent Series Offers Contemporary-Style Laminate And Raised, 1" Thick Floating Tops. Cherry Laminate Surface And Side Panels Are Built For Durability And Are Stain-Resistant And Scratch-Resistant. The Top Is Supported By Aluminum Brackets To Provide The Floating Appearance. Four Doors Feature A Gray Aluminum Frame And Frosted Gray Glass To Keep Contents Private But Identifiable In The Two Compartments. Shelf Holds Up To 44 Lb. (20 Kg.). Use The Grommet Hole For Easy Cord Routing. Design Also Includes 3mm Pvc Edges (Color-Matched).